A split door frame is another door frame repair you may need to make. It is possible for a door jamb to split when the wood dries out. Another way a door frame can split is when it is forced open for whatever reason. Not sure if this is your problem? See the article 'Troubleshooting Door Problems' for more information. What you need to do depends on how bad the split is and whether the integrity of the frame is compromised. A split that affects the hinges or the strike plates is not just cosmetic. A minor split may be cosmetic. Use wood putty to fill the crack and paint or varnish the door as needed. 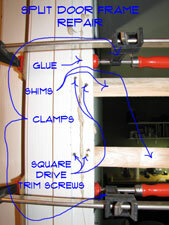 For a more serious split you may be able to glue and clamp the door. At this point you may need to decide if you will be happy with the patched up door frame when you are done. Take the trim off the door on both sides using a flat pry bar. Add some door shims behind the damaged area to support it. Use a construction adhesive like liquid nails in the crack. Use a couple of bar clamps to draw the frame back together. With the frame drawn back in shape, add a few 2 1/4” trim screws on either side of the split. Check the directions for the glue to find out the drying time. Leave the clamps in place until the glue has set. Replace the trim using finish nails or trim screws. Check for objects that could fall before you start pounding on the wall. With the trim in place you can replace any hardware that needed to be removed. You will probably still be left with some cosmetic issues. Use wood filler or putty to blend in the remaining visual issues. Touch up the paint or varnish as required. How does it look? Hopefully you are satisfied with the results and this has been a successful door frame repair or door jamb repair, depending on which term you like better.